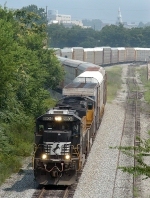 Description: NS283 bypasses Brosnan Yard at Edgewood. Description: Soon to be Z97012 pulls through Mt. Venron with TFM 1402 on rear. Description: The train with fairly diverse power backs into the yard after pulling onto the mainline. The SD60M was freshly repainted. Description: 432 EB in the snow. Only the 2nd time I have caught a loaded coal train EB here. Description: Talk about track profile! Description: 8804 flies through the yard with a loaded coal train; A second WB is easing into the yard; the local on the left just dropped some empties. Description: With one more train to depart (south), the rain held off until the very last car! The C&W from Harrisonburg was waiting for that train to leave at the far south end of the yard. So with the approaching storm, I counted my blessings and went home!! Description: Through the doubletracking construction zone 789, Metuchen Road, 0925 hours. Description: Holding behind the 30R, waiting for him to get his switching done. Description: A very long 25R crosses 3rd St. and approaches the summit at 8:10AM. Description: The best Dash 9's around. 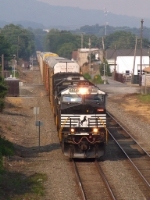 Description: The best type looking dash 9, in my opinion, trails as it comes into Northtown Yard. If only more roads got this type. Description: hiding behind the diesel house in Grand Forks.